Global trends in policy and technology related fields are rapidly reshaping the port industry worldwide. International in scope, this volume provides multidisciplinary insights into the role port cities adopt in dealing with global supply chains. 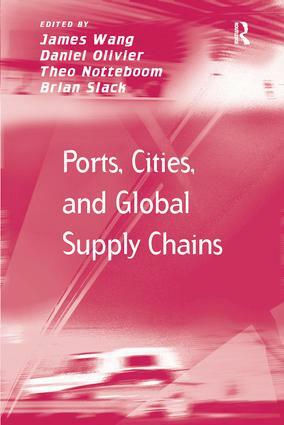 Throughout the book, concepts of strategic management, supply chain management, port and transport economics and economic and transport geography are applied to offer an in-depth understanding of the processes underlying global supply chains and associated spatial and functional dynamics in port-cities. The book also discusses policy outcomes and implications relevant to port-cities positioned in different segments of global supply chains. Contents: Introduction, James Wang, Daniel Olivier, Theo Notteboom and Brian Slack. Part 1 Conceptualization of Port-Cities and Global Supply Chains: Supply chain and supply chain management: appropriate concepts for maritime studies, Valentina Carbone and Elisabeth Gouvernal; Global supply chain integration and competitiveness of port terminals, Photis M. Panayides; The terminalisation of seaports, Brian Slack; Re-assessing port-hinterland relationships in the context of global supply chains, Theo Notteboom and Jean-Paul Rodrigue. Part 2 Shipping Networks and Port Development: The development of global container transhipment terminals, Alfred J. Baird; Mediterranean ports in the global network: how to make the hub and spoke paradigm sustainable?, Enrico Musso and Francesco Parola; Northern European range: shipping line concentration and port hierarchy, Antoine Frémont and Martin Soppé; Factors influencing the landward movement of containers: the cases of Halifax and Vancouver, Robert J. McCalla. Part 3 Inserting Port-Cities into Global Supply Chains: Globalization and the port-urban interface: conflicts and opportunities, Yehuda Hayuth; A metageography of port-city relationships, César Ducruet; Chinese port-cities in the global supply chains, James Wang and Daniel Olivier; The economic performance of seaport regions, Peter W. De Langen. Part 4 Corporate Perspectives on the Insertion of Ports in Global Supply Chains: The success of Asian container port operators: the role of information technology, Daniel Olivier and Francesco Parola; Which link in which chain? Inserting Durban into global automotive supply chains, Peter V. Hall and Glen Robbins; Sustainable development and corporate strategies of the maritime industry, Claude Comtois and Brian Slack; References; Index. James Wang is Associate Professor in the Department of Geography, University of Hong Kong, China. Daniel Olivier is a Research Student and Teaching Assistant in the Department of Geography, University of Hong Kong, China. Theo Notteboom is President of ITMMA (Institute of Transport and Maritime Management Antwerp) and is also affiliated with the Department of Transport and Regional Economics at the University of Antwerp, Belgium. Brian Slack is Distinguished Professor Emeritus in the Geography Department, Concordia University, Canada.